To reconstruct his story is to immerse oneself in the complexity of Trieste in the Habsburg era, and similarly in the complex affairs of Generali, a company of many hues. Members of the important Richetti family of Trieste were prominent in civic life, and in Assicurazioni Generali, for at least three generations. During his career in insurance, Eugenio Richetti was a Generali agent in Lviv, Galicia, the birthplace in 1855 of one of his three sons, Egidio, who was in turn employed by the Agency of Rijeka and Prague. 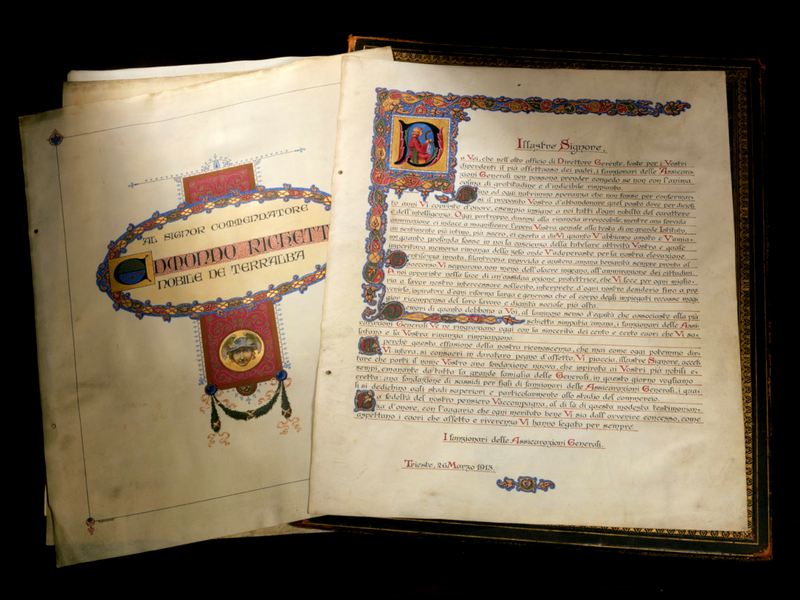 The other two sons, Ettore and Edmondo, played leading roles in the Trieste Head Office: Ettore, a lawyer, was a member of the board from 1896 until 1915, when he became a director, while Edmondo held the post of Company Secretary for almost two decades. 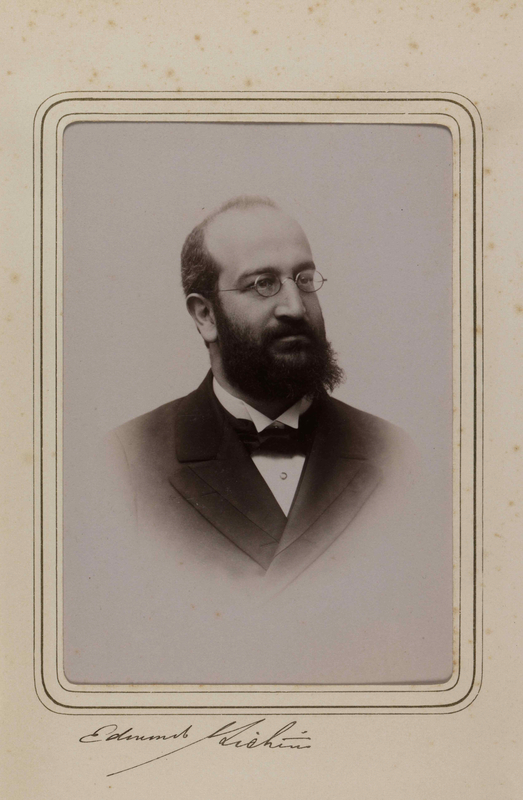 Edmondo began life in Generali in 1883, aged twenty-seven, as head of Erste Österreichische Allgemeine Unfall-Versicherungs-Gesellschaft, a subsidiary company in Vienna specialising in accident insurance, one of Generali Group’s first activities. He later became a director, eventually moving to Trieste in 1890, first as Deputy Secretary General and then as Secretary General, with a prominent role as a link between management and administration. He led a secretariat of numerous functions and represented the Company in professional bodies such as the Trieste Chamber of Commerce, of which he was president. Richetti was Secretary General until 1909, and later Managing Director – a title that was changed in statutory reforms reinstating the office of President – until retiring in 1913, shortly before his death in August 1914 at Reichenau, in Austria. He was made a director in his final months of service. Edmondo Richetti belonged to the Trieste economic aristocracy termed by the scholar Anna Millo an “elite of power”. He succeeded his brother Ettore as head of the Jewish community and was one of the few members of the middle classes to be awarded the title of Cavaliere, being known as Richetti de Terralba from 1904. As an entrepreneur, one of his ventures was to found Alba, Trieste’s first car manufacturer, which was not successful. While his brother Ettore, a representative of the liberal-national party of Trieste, was sought during the war years by the Austrian police as a separatist extremist, Edmondo belonged to that cosmopolitan bourgeoisie that found itself at ease both in Trieste and in Vienna, where he settled with his wife Wilma Weiss. His sister-in-law Helene Weiss was among Freud’s first followers, and was possibly introduced to him by Richetti. His activities are recorded in numerous Archive documents, such as minutes of the Board and Secretariat correspondence. However, he left his most original legacy in his personnel file, in the form of an extraordinary pamphlet advocating peace, entitled Gründung des Vereines “Europäischer Staatenbund” and printed in Vienna in May 1914, on the eve of the outbreak of the First World War. For further information on Richetti: A. MILLO, Edmondo Richetti, in Generali in History. Tales from the Archive. Twentieth Century., Venice, Marsilio, 2016, pp. 76-79.